Hailing from Camforth, UK, MASSIVE WEAPONS is a rock band that worked and toured a lot in the last years. And the work has given them fruits, they now reached UK top 40 charts at #16, which is a pretty big achievement if you know what i mean. 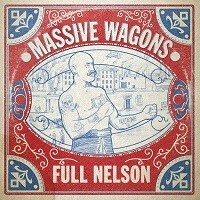 "Full Nelson" is their fourth album since "Fire it Up" back in 2011, and they have signed with EARACHE RECORDS. "Full Nelson" holds twelve tracks.The first track, under no illusion is a catchy Pop Rock song that has all what it takes to please vast audiences. Baz's vocals are great and clean and put in the forefront. This is Soft Rock, very entertaining, and an easy listening ride. It's nothing new or original under the sun but its quite well done and enjoyable so it hits the spot as it should. We have great acoustic guitar at the end of the track and even if the song seem basic, I can hear the work behind it, all is calculated to bring a solid pop experience. The next track, "China Plates" has a more uptempo approach and punk attitude. Nice way to warm it up and make listeners move. It has a punk rock structure and energy, also a great sense of humor. One thing i can say they now how to entertain. "Billy Balloon Head" is the song to play live. It's funny as hell and a nice pick to have fun with friends. There is also Cowbell Leave your serious life behind you and have fun tonight. Laugh, sing, cry, do whatever you want but have a good time. That's what this is all about. Nobody will stay passive listening to this. "Sunshine Smile" reminds me of California's Glam Rock acts like MOTLEY CRUE or even POISON .It has all the elements to fit in that category. It's cool one but not the highlight of the album. "Northern Boy" is acoustic guitar powered. Mills' vocals are flawless. He's got a natural voice and talent for singing. It's an interesting optimistic power ballad,with a moving guitar solo between bridges. This is the song for gathering people together and sing along. "Robot(Trust in Me)" is the song that rocks the most for the six first songs of the record. It has samples, and the guitar is more melodic and used. Also, we can feel more the work of the two guitars altogether in this one. It's great rock n' roll. Backing vocals and harmonies are performed and this is quite welcomed and great. "Back to the Stack" is an easy listening experience. It has great energy supported by a punk structure once again and gives a cool ambiance and atmosphere of positive mix of happiness and good vibes. "Hate Me" sounds like some GREEN DAY a lot. It's very similar, let's say a British version of it. "Last on the List" has a massive potential of singing along and sharing a good time with friends. It's a mid tempo invitation to sing and smile all night long. These guys are made for playing live. While listening to this song, I could imagine people having fun, dancing and enjoying the ride. "Ballad of Verdun Hayes" is a song about that man (Verdun Hayes) who has the skydiving world's record of diving at the age of….101 ears old! Congrats Mr Hayes! "Ratio" is slowing down the pace a bit. I really like that one. They have what it takes to produce songs that are catchy while being very effective and well written and done. I understand why they climbed up the charts so fast! "Tokyo" is the last of twelve and shows excellent melodic guitars the cycle ends with a fade out like we were used to hearing in the 80's. Well this one is flawless guys! This is the perfect album for leaving on a road trip, or starting a new life. What a great refreshing moment!